One year has passed since the incident at the MEN Arena. Although times have moved forward, the loss and trauma that every citizen experienced at the time of its occurrence is impossible to forget. Today, a number of commemorative events are taking place within the city, including M1 Festival, which has a ‘free entry, donations on the door’ policy. The mixed-genre festival is bringing the likes of Katbrownsugar, natural sciences, and Clint Boon to Fac 251 from 6:00 pm till 3:00 am, and is raising for the We ❤ Manchester Emergency Fund. For more information on the festival, head to the Skiddle ticket page. More details about the emergency fund are listed at the bottom of the article below. Below is an article that was titled ‘Almost a Week On: Don’t Look Back in Anger’. This was published on funraising.tumblr.com on the 26th of May 2017, and was an attempt to encapsulate and celebrate the strength of the Manchester community. The article has been left in its original format. Despite the name ‘Funraising’, this platform intends to shed light on community spirit of all kinds. 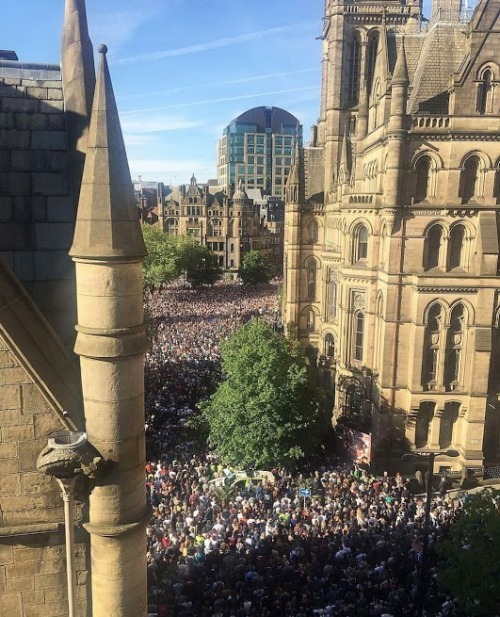 As everyone is aware, the greatest tragedy struck Manchester on the night of the 22nd of this month, and yet the city has borne through with immense strength, power, will and resistance. The city did not need bolstering, and yet one would believe it has been bolstered. In reality, Manchester is only as bolstered as ever was. An entire history of difficulty and hardship has raised a community hard-workers, of unspoken bonds, of cultural pride. A community that has, can, and will overcome. 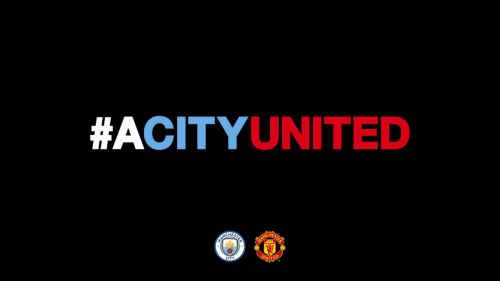 Never has this been more evident than now, for the ways in which Manchester city’s people have come together is innumerable. In four days, the Manchester Evening News has already raised £1,649,907 of their £2,000,000 target. Administered by the British Red Cross, this money is to be spent on the families of those directly affected. Whilst it is important to understand that there are many causes around the world equally deserving of funding, I think that this cause is undeniably important. The pounds that would have loitered in the pockets of our many are far better when they are taken out in support of our affected. These are hard times, and the media attention spayed on victims alone is traumatic. No-one can quantify how much harder everything else on top of this might be. Money certainly doesn’t buy everything, but it’s one less thing to worry about at the end of the day. Some are born here, some drawn here but we all call it home. All the dreamers and schemers who still scheme through the streets’. The literary past is rife with Northern literature. Today we’ve seen Simon Armitage rise, and Lemn Sissay’s work plastered all over our walls. It would be no surprise if Longfella were to join them in history, courtesy of ‘This Is the Place’. In echo of this, Ed Woodward, executive vice-chairman of Manchester United said: “The barbarism of Monday evening’s attack has shocked everyone. Our clubs are right at the heart of our local communities in Manchester and it is right that we present a unified response to this tragedy. If you have anything to say about the paradox of media, please feel free to voice them in the comments section below. I think it’s vital that we voice concerns and remain open to the ideas of others, because the process of debate is key to how we understand, learn and grow. It is key to moving ‘forward’. (where ‘forward’ lies is in itself debatable, but I maintain my statement). And there are still a variety of creative campaigns contributing every day that passes. A great many people are completing the ‘Great Manchester Run’ this Sunday, a large amount of them for the British Red Cross fund. Another notable contribution is the thousands of pounds coming in from the bee tattoo appeal. 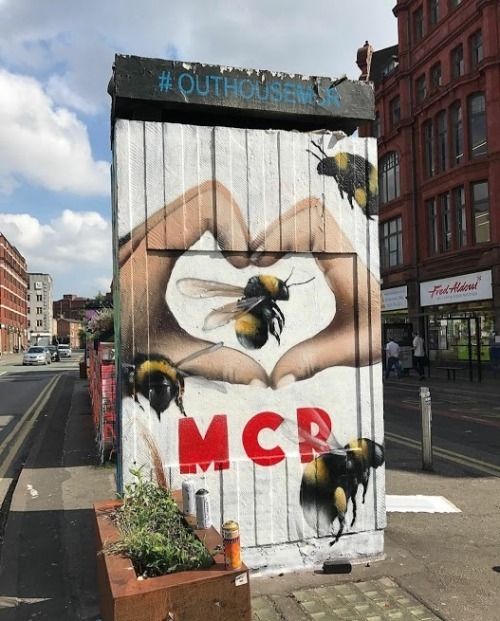 As many know, the Manchester worker bee holds a lot of symbolic value for the city. Tattoo parlours from all over the country have pledged to give all proceeds from bee tattoos to the Emergency Fund. People have swarmed to get tattoo’d, and parlours all over Manchester have had queues that run outside their doors. A parlour in Fallowfield is booked up all weekend, but is accepting a limited number of walk-ins early next week. The symbol of the bee has been shared for years, and it’s touching to realise that this is now going to be a common bodily bond too. The physicality being lent to this visual media is so telling of the strength that I hope has been made clear in this entry. Manchester has remarkably stayed both strong and sensitive in light of the hardship that has befallen it. The people have refused to look back in anger, and have produced pure heart. I hope that I’ve managed to accurately convey the tight-knit community that is at work in this old textiles town. On that note, I will leave this post with a final request. The emergency fund is ever growing and I encourage you to help it do so. I think it’s important to note that the trauma that has been encountered is not short-term. The people that have been directly affected by the incident will need support for an indefinite period of time, and we ought to be giving it, one and all, as long as we can. We must not treat this like a phase, for we can move past it, but it should never leave us. We should always assist the families and dependents of the 22 people who have been lost, and not forget those of the 64 wounded and critically injured. We have stood together, and we must #standtogether. **Please note that at the time that this article was written, no more up to date information about Chris Parker had been released.